Micromax has forayed into the Indian tablet market with the launch of 'Funbook'. The new Micromax tablet runs on the latest Android 4.0 Ice Cream Sandwich platform and is powered by a powerful 1.2GHz processor. The Micromax Funbook has been priced at Rs. 6,499, and takes on other Indian budget tablets such as Zync Z-990, WishTel Ira, Beetel Magiq and HCL's ME Tab U1. Micromax made the announcement via a liveweb cast on Facebook. Speaking of specifications, the Micromax Funbook features a seven-inch display with 800x480 pixel resolution, a 1.2GHz Cortex A8 processor with a Mali GPU. The devices has a 4GB of onboard memory, expandable via a microSD card. It has a 512MB of RAM. The Funbook comes with a 2,800 mAh battery and sports 3G dongle support via a USB and 0.3 megapixel front facing camera. The Funbook comes with a range of multimedia functionality, offering 600 movies in nine languages over 6000 songs and 4000 videos and also provides a Live TV app. Micromax has also partnered with Tata Photon to bundle EV-Do data card with 1 GB of additional download for two months. The Micromax Funbook tablet is available in slate grey and black colours. Back in March, a Micromax tablet called P-300 was spotted on a shopping site with a price tag of Rs. 7,999. The website, however, later pulled the product from the website. Micromax has certainly heated up the budget tablet segment with the launch of the Funbook slate. With a price tag of Rs. 6,499, Micromax Funbook is likely to be cheapest tablet to run the latest Android ICS platform. 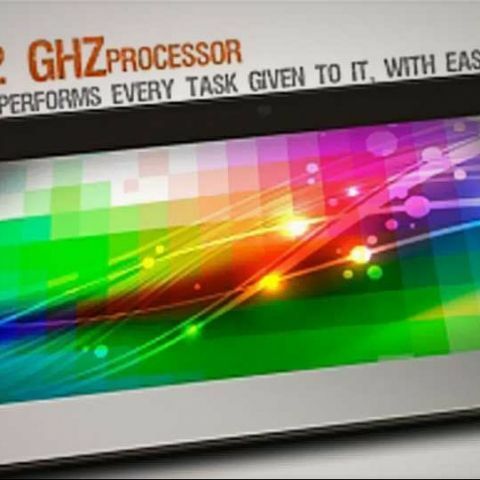 Zync's Z-990 tablet, which was launched recently, comes for Rs. 8,990, which is Rs. 2,500 higher than the Micromax Funbook. Micromax seems to be applying the same “low-cost” strategy in the still nascent Indian tablet market. Android Smartphone under Rs. 10,000!